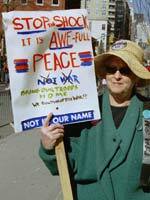 Browse photos of the March 22, 2003 New York City anti-war March. Read more articles in the War section of this site. I knew it would be big when I saw all those people with signs get on the F train in Brooklyn. 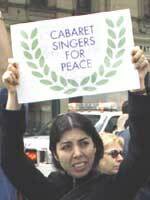 At the next stop a woman entered and began haranguing the people in the subway car about our invasion of Iraq, not realizing that all but a handful were already partisans of her cause. 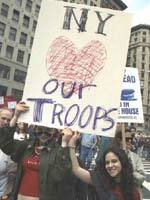 She mistakenly told everyone to go to the anti-war rally in Bryant Park. I had picked up a leaflet advertising the march only two weeks earlier — usually these things take months to organize. By the time I exited at 42nd St., where the leaflet said the march would begin, the car was full of people dressed for protest; at the platform many more exited from the other cars. The march wasn’t even scheduled to start for another 45 minutes. 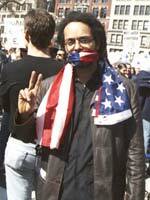 There was no rally in Bryant Park; there was no rally, period. The police hadn’t wanted any march at all, just a gathering like the overcrowded mosh pit near the UN in February. 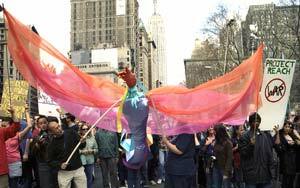 Organizers convinced the police to permit people to walk the two miles down Broadway from Times Square to Washington Square Park. There was no rally there either; just a loudspeaker telling everyone to disperse. Nonetheless, marching is much more satisfying than just standing around, and much less conducive to mischief making. I don’t know when or where the march started. I never saw a front line. Rivulets of people flowed from side streets onto Broadway to join the stream of humanity. There weren’t many barricades, or cops channeling the crowd, so the stream eddied onto the sidewalks. Occasionally someone with an armband would stop a section to create more space in front. On some side streets I could see lines of police with motor scooters, waiting for something to happen. I walked fast, threading my way through the loosely packed crowd, occasionally stopping to take a photo. I was trying to get to the front line in order to photograph it. 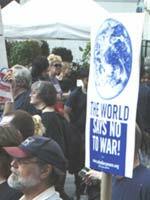 Somewhere in the 30s I found what looked like a front line, right behind a large banner saying “The World Says No to War.” But there were tens of thousands of people in front of it, as well as behind. This, and similar signs in numerous languages, were among the few formal, printed, posters. 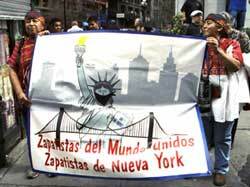 Most signs were hand-made, attesting to the spontaneity of the march and the strong personal feelings of the marchers. When we reached Union Square I saw a long 3-foot-high lane barricade which made a good photo platform. Of course dozens of other photographers had the same idea so finding a spot with a clear view required some precarious stretching and balancing. However, when I yelled at someone with a great sign to stop, they willingly did so, and turned my way. What was most impressive about this crowd was its diversity. 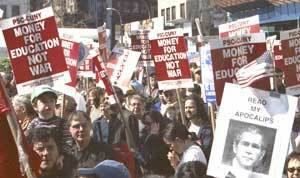 Those marching against the war in Viet Nam were mostly young; the age range in this crowd was wide. 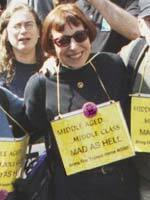 There were the usual left-wing sectarian groups but their signs were dwarfed by the more personal signs carried by ordinary people. 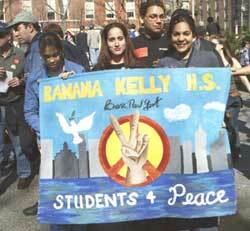 Some were held by teenagers; some by seasoned protestors. 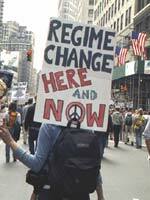 One man told me he had carried his sign in protests against the 1991 Gulf War; one woman had saved her generic peace poster from Viet Nam days. When I reached Washington Square a marshal was dividing the line in two, one line going on the north side of the park and one down the east side. From these streets people went home or wandered around the park, looking at each other’s signs. Earlier a group had sat down in the street running north of the Square and refused to move. Several dozen were arrested. I saw a small group sitting in the middle of that street, but the only traffic they disrupted were other marchers; they left when the police asked them to. 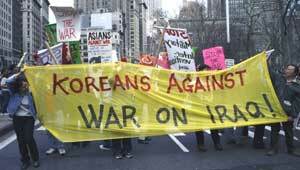 It took two years of organizing marches against the war in Viet Nam for the numbers to reach those achieved in only six months against this war. Estimates on the number of marchers ranged from 100,000 to 250,000 depending on who did the counting. Although I didn’t see the whole thing — in fact because I didn’t see the whole thing — I lean toward the larger numbers. I walk fast; for smaller marches I can usually see the entire march, sometime twice. Even though I left Times Square early, I never reached the front line. 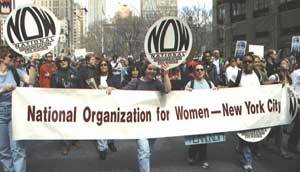 There were marches on this day all over the world; New York’s was the largest, even though New York City was still feeling the effects of the September 11, 2001 attack on the World Trade Center. New York remains a wounded city. The collapse of the World Trade Center left 2,874 people dead and about three dozen orphaned children. The subways under and near the WTC site are now running, and most local businesses have re-opened, but the economic effects were widespread. Over 90,000 private sector jobs were lost in the year following the attacks. The GAO estimates that September 11 cost NYC 1.6 billion dollars in revenue in 2002, and will cost another 1.4 billion in 2003. New York State, Connecticut and New Jersey also lost billions of dollars as well as people. This means that thousands of government employees will lose their jobs and services will be curtailed. President Bush promised 10 billion dollars in assistance, but it hasn’t been forthcoming. 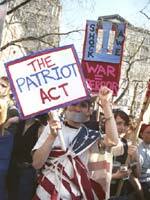 Federal money was used to attack Iraq in the guise of preventing another September 11, not to help those victimized by the attacks. 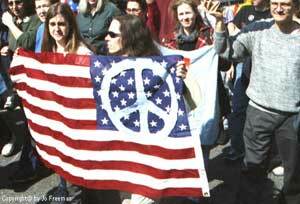 Despite these losses and despite the wound, New Yorkers turned out in large numbers to tell the world that the war on Iraq was not the response they wanted. Attacking Iraq won’t prevent another terrorist assault; it might well make it more likely. 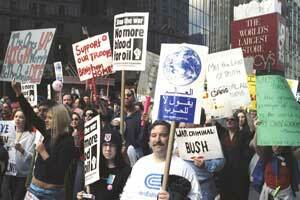 Killing Iraqis won’t bring those killed in the WTC back to life; nor will it punish those who did the damage. This looked like the front line, but it was in the middle of the march. 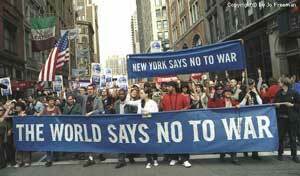 Voices from many countries say NO to war. 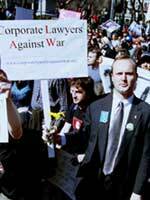 Numerous organizations went on record in opposition to this war. Colorful puppets and posters were abundant. 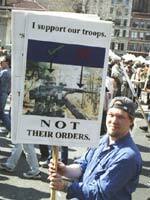 Support the soldiers, stop the war.